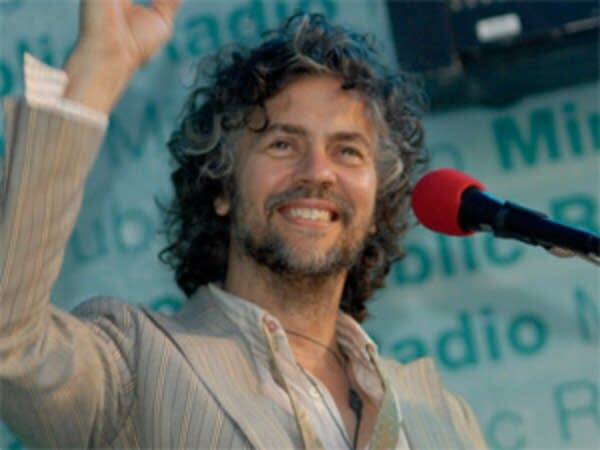 Wayne Coyne has been leading the Flaming Lips for over two decades. In the late eighties, you never would have guessed that the scrappy little outfit from Oklahoma lead by a Long John Silver's worker would not only still be around but would headlining major rock festivals, and having their songs used at weddings. Wayne joined Mary Lucia in front of a soaking-wet crowd of fans at the Minnesota State Fair to discuss animal costumes, Jimmy Page's otherworldly presence and why he considers the Midwest to be the best place to live. Jim Derogatis and the long-lived "Lips" Music critic Jim DeRogatis thinks that only a few people in the rock world qualify as geniuses, and that Wayne Coyne of the Flaming Lips is one of those people.